This page is not meant to be an all-inclusive history of Polk County but just a collection of miscellaneous stories. 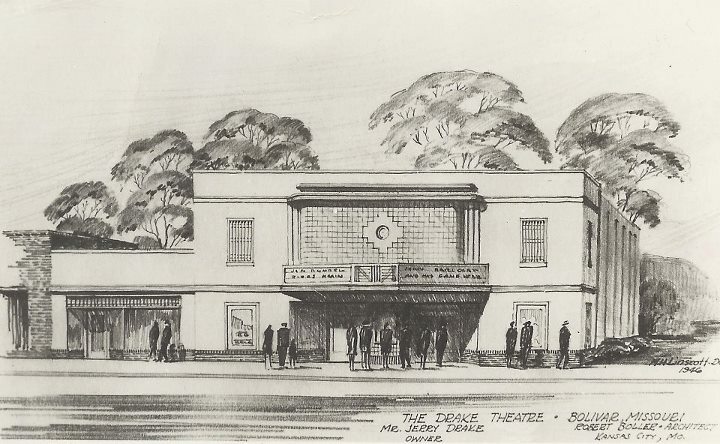 While working on a walking tour of downtown Bolivar, (one of the many projects I plan on finishing this year) I Googled the Drake Theater in Bolivar, MO looking for a photo for the booklet from the opening in the 1940s. I did not get many hits on my search but one listing made me sit up and take notice. The listing showed architectural plans for our theater at the State Historical Society Research Center - Kansas City. Could we be so lucky? I called there and had a delightful conversation with Nancy. She affirmed that, yes, they did have them in a collection from a famous architect Robert Boller. She sent me copies of the plans. I already had a file on theater history in Bolivar and this seemed like the time to write it up and share it. For more information on Robert and Carl Boller see the book Windows to Wonderlands: Cinespace Creations by the Boller Brothers, Architects, by Noelle Soren 1999. Motion pictures found a permanent home in Bolivar in 1908 with the opening of the Bolivar Electric Theater on the east side of the square. The advertisement said it was "the only first-class motion picture and illustrated songs ever given in the city." Admission was 10 cents and the show changed every Tuesday, Thursday and Saturday. Bolivar’s Electric Theater was soon followed by other theaters in town, such as the Novelty Theater, owned by Mr. Watson and the Cozy Theater, opened by Henry McCaslin on North Main Ave. McCaslin also had picture shows at Flemington and Weaubleau. By 1914, picture shows were becoming so popular in Bolivar that the city council developed the Board of Censors of Moving Pictures and assigned Rev. P. T. Harman, J. A. Lamun, T. H. Douglas, Mrs. J. W. Nicolay and Miss Lois Roberts to the board. At about this same time a local man named Jerry Drake (who would later elevate our movie enjoyment) was getting his start in the movie business by working at an electric theater located in Clinton, MO. In 1928, Mr. Howard Davis purchased the overall factory on North Springfield (see previous story on the pants factory) and planned to tear it down but instead he renovated it and named the new theater the Davis Ritz Theater. Mr. Davis leased the theater to a man named T. F. Cole to manage. Mr. Cole had theaters in Bonner Springs, KS, Grandview, MO and Marshfield, MO. The renovations were extensive and included seating, plumbing, a new organ to play along with the movies and a stage large enough to accommodate traveling road shows. The color scheme was done in three shades of green with gold accents. The seats were in a dark mahogany finish with gold colored padded seats. A wonderful electric sign was hung above the canopy announcing the name of the theater. The slogan for the new theater was "The Utmost in Entertainment." He also made the promise that "no picture will be run that can possibly offend." The first picture shown was "Gang," followed by "Adam and Evil," both comedies. The music for the picture was played by Miss Jean Allen Gravely, piano, Professor Robert Lindell, cornet and saxophone and Jack Stewart, drums, all of Bolivar. The first live show at the theater was "White Pants Willie" which also came with a seven-person troupe of Hawaiians. Today we are always asking people to "Buy Local" and the 1920s were no different. Mail order catalogs were taking a lot of money away from our local merchants, so much so that the Davis Ritz Theater offered free admission to any child that would present them with a mail order catalog of over 50 pages. The Herald warned the theater that since catalogs came in by the truck load at the post office they needed to be ready for a lot of children seeing free movies. In 1928 the theater also gave children free tickets if they participated in Bolivar’s annual "clean up day." The Electric Theater tried to compete with the new Davis Ritz by bringing in such acts as Prince Karmi, the world famous seer. Karmi did a mentalist show and also drove a car blindfolded around Bolivar. But by April of 1929 Jerry L. Drake had bought the Davis Ritz Theater and the Electric Theater. He immediately closed the Electric Theater. He then moved his family back to Bolivar from Warrensburg, MO where he had been working in a theater. Jerry had worked at and studied theaters for years and as soon as he took over he started a slew of movie specials. He had a "Bargain Night" on Mondays where two could get in for the price of one 25-cent ticket. Wednesday nights were "Family Night" where the whole family got in for 35 cents. Saturdays were devoted to western movies and occasionally there were midnight movies. Jerry also installed a sound system so that a music track from the phonograph that was sent with the movie could be played. In that same year Jerry also hosted an indoor circus called the Snyder’s animal circus which featured bears, goats and monkeys. It was billed as "the best indoor trained animal circus on the stage today featuring Martha, the wonder bear, direct from Ringling Brothers Circus." He also hosted any event that needed a stage and would draw a crowd to his theater, such as style shows, cooking demonstrations and beauty pageants like the one in 1932 where Miss Helen Kelly was crowned Miss Bolivar. Talking movies came out in 1923 but, at that time, the equipment was very expensive, as was the rental on a talking movie reel. However, Jerry lost no time in preparing the Ritz to accommodate a talking picture show and in 1930 he invested $13,000 for installation and weekly service from the Western Electric System of Sound Movies. He showed the first talking movie in Bolivar on Monday, May 5, 1930. The first film was a short from the Western Electric company explaining the science behind the creation of talking films with the main feature being the movie called "Red Hot Rhythm" starring Alan Hale. A clip from the movie can be found on YouTube using the title "Red Hot Rhythm" (1929). Jerry also raised the price of admission from 25 cents per adult to 40 cents per adult during prime time but he kept the matinee price at 25 cents per adult. He also kept the child’s admission at 10 cents. In 1938 the Ritz became affiliated with the Dickinson Theater company which allowed Jerry to bring in movies right after they were shown in Springfield. The Ritz also had another face lift with the old seats being reconditioned and 250 new upholstered seats in blue and silver being added. These improvements, along with the air-conditioning added in 1937, made the Ritz one of the best small town theaters in the area. In 1940 Jerry added a few new promotions to his roster. One was the "Tin Can Matinee." Children were encouraged to collect a dozen tin cans of quart size or larger from the streets of Bolivar and trade them in for a matinee ticket. However the promotion most interesting to me was the addition of a "Local News Reel." Jerry Drake bought some news reel camera equipment and proceeded to visit the local happenings to create a movie. He shot films of local events, scenic beauty spots and projects in Polk County. The first one was shown before the main movie in September of 1940 and featured shots of Polk County folks at the state fair in Sedalia, the end of the swimming pool season, the August Bolivar Pot Of Gold Day, the crowd at the Karlin picnic and the opening of the school here. At the end of the year he picked the best footage and made one long movie of the year in review. I would love to get my hands on some of these news reels that Jerry shot. I even went so far as to track down his son in Colorado and ask what happened to the films. Jerry’s son told me he had no idea where they went but that neither he nor his family inherited them. I bet they are hiding in a closet or attic somewhere in Bolivar. If you find them, please let me know so we can archive them and share them with Polk County. One of the local news films even ended up in Santa Paula, California. This happened because of Ted Bridges, who while visiting family in Bolivar in 1942, saw a horse belonging to Bert Mahaffey in the film and took the movie to California to show a potential horse purchaser. The Palomino horses featured in the film were purchased by Mr. and Mrs. E. E. Converse of Santa Paula. In 1933 Jerry had met and formed a friendship with a gentleman named Robert Boller, a well-known theater architect, who had recently purchased a small farm property near Pittsburg. This friendship was called into play when Jerry decided it was time to build a brand new theater in Bolivar in 1945. Jerry hired Robert to draw the plans for the new theater. The new theater had many difficulties in its construction phase due to the newly completed war. One of these was because of the Civilian Production Administration (CPA) rules and in July of 1946 construction was halted on the theater. The CPA ordered all construction in the United States put on hold after March of that year to allow the country to recover from WWII. Jerry stated "We had all our materials bought before the deadline. But we had to blast before we could put in the footings." Walter Russell, a local contractor, led the construction team and they used as many local firms and laborers as they could. In view of the fact that the seating company can not furnish seats on a schedule we will be unable to open our new Drake Theater as soon as planned. We do hope to open as soon as it is possible to do so and will be worth the wait. In the mean time we will give you the best of entertainment at the Ritz and believe our holiday offering will please. The Drakes did not give up and despite many delays they opened in March 1948. The opening night had a temperature reading in the four-below-zero range but, despite the weather, huge crowds arrived to the opening night. The theater had a seating capacity of 700. The seats were upholstered in red leather. There was an ultra-modern lounge, ladies powder room, the best in sound, projection and lights, full-view seating, modern deluxe refrigerated fountain, year round air-conditioning, new Da lite green exquisite carpet and drapes. The first movie shown in the new theater was "You Were Meant For Me." Ticket prices were Adults, 45 cents, Children, 10 cents. As soon as the Drake Theater opened Jerry closed the Ritz Theater and converted it into a studio where he edited and produced his news shorts of local happenings. He also sold Bell & Howell film equipment and equipped the old Ritz with three soundproof booths for voice recording. In 1980 Jerry L. and Edith Drake transferred ownership of the Drake Theater property to their son Jerry S. Drake and his wife Virginia who now reside in Colorado. Jerry S. sold the workshop (on the west side, now Offset Printing) to the Cooper Family in 1986. Jerry sold the theater property to James Cox, Kevin Cox and Luann Bean in 1987. The theater was renamed the Esquire. One of these owners leased the theater to B&B (Bills and Bagby) who were and continue today to be a large theater holding company. In 1998 B&B built a new four-cineplex theater on the south side of town and closed the Drake. Kevin and Luann quit-claimed (deeded) their share to James Cox and in 1999 he sold the property to the First Baptist Church of Bolivar, located to the north of the theater. The church converted the space into a place for a casual worship service that is held on Wednesday night each week, featuring country and contemporary Christian music, live drama, video clips and an inspirational message. On Sundays the theater is used for Bible Study and a contemporary worship service, held in conjunction with the service held in the main church building. Happily, the theater still shows movies occasionally as it is used by both FBC and the Bolivar schools for family-oriented, kid-friendly movie showings. The Drake has retained a lot of her beauty, thanks to the Drake Family, the B&B Theater Company and the First Baptist Church and it is my hope that this trend will continue. This got me to thinking about the oil well that was near Karlin in the 1920s. And, so began another journey into local history. west of the railroad right away in Bolivar. They stated that they had already drilled two wells on the property. start drilling within 30 days. and had a derrick shipped by rail to Karlin from the Story Archt & Wellborn drilling company in Oklahoma. The projected depth of the oil well was 2,500 feet. The well was located on Mrs. Margaret Hubbert’s land about a quarter of a mile west of Karlin. The company started installing holding tanks to receive the oil as soon as it was pumped. an adjective meaning “sloping downward from a common crest.” The geologist's report stated, “The Karlin-Bolivar Anticline comprises the fold in the Mississippi Lime that is located between the railway station of Karlin and the town of Bolivar." He also used the fact that natural gas had been found in a 200-foot water well that was drilled near the railway station in Karlin. The derrick and well-drilling equipment shipment created a lot of interest. The paper reported that the shipment consisted of over 75,000 pounds of steel. The large 40-horsepower Ajax motor and boiler weighed in at 19,000 pounds. The 3,500-foot cable ran about 4,800 pounds and the drilling stems, of which there were three, ran 2,000 pounds a piece. It also came with a complete blacksmith shop. They stated that they would be ready for “spudding in” on April 10 and expected the drilling to commence quickly. company or to buy stock in the oil well for $25 a share. There was also interest from other oil wildcatters but they found all the land around Karlin and Bolivar already leased. All of this excitement filled the hotels and stores in Bolivar. Land prices were soaring and town lots were selling at a record pace. Bolivar was becoming a boomtown. Within seven days of the spudding in they hit the 200-foot mark and found natural gas, which is a marker for oil. Within another few days they hit 400 feet and the drill was pounding night and day. By this time the other oil speculators had leased 15,000 acres of land in the Buffalo and Halfway area and were just waiting until they could close a contract with a rig building crew. would take a few days for it to arrive. or until they hit oil. In the meantime the company hit oil outside of Fort Scott and their focus shifted to that well. on the northwest corner of the square). The company was reformed with local officers taking over the leadership role. The company was capitalized at $150,000. suspended while the stem was shipped to Joplin to be repaired. The timing on this was awful as they had just started to show oil in the "slush pit." The slush pit was where the debris from the drilling was poured. The company pleaded with the public to buy stock now so they could raise the $7000 it would take to put casing in the well. At 1600 feet they entered “brown sand”--this is a sand layer with oil mixed in. Word of an imminent gusher spread through the area and the company once again pleaded with the public to buy stock so they could continue to drill. In November they installed the casing and this shut off the showing of oil, so they decided to continue to drill deeper in hopes of a gusher. In December they entered 1700 feet and still needed more capital but luckily the well was showing an abundance of oil and natural gas. To save money, they ordered six-inch casing and shut the well down until it arrived in Feb. of 1922. When the well reopened, drilling resumed day and night but it was hard going--some days they made only three feet of progress. The local company was plagued by financial difficulties and the slow drilling, lost drill bits and broken equipment had them running out of money every couple of months. The well finally reached 1930 feet in June of 1922, far short of the 3000 feet they felt was needed to hit a gusher. In January of 1923 the drilling company Story-Abricht and Wellborn filed suit in Polk County against the Springfield-Bolivar Oil and Gas Co. for $13,567. The Springfield–Bolivar Oil and Gas Co. filed a counter suit and, after dragging through the local court for the next four years, the case was finally ruled on in May of 1927 with neither party winning and with all of the charges being dismissed. hole at Karlin with no oil. I believe that signaled the death of oil exploration in Polk County. to hit $5 a gallon by this summer. In my ever-widening quest to understand the history of Polk County, I spend a lot of time reading the old newspapers and, since Polk County was mainly an agricultural area, the weather played a large part of what was on people's minds and hence reported in the local paper. Our first weather forecasts in the 1800s were delivered to Bolivar by telegraph and the forecast for that day was relayed to Dan Farrar’s drug store on the north side of the square. Dan had a weather pole in front of his business. He would raise different flags high up on the pole denoting the expected weather. Dan was such a weather fan that he had the first phone in Bolivar installed between his store on the north side of the square and the telegraph office located at the train depot. This way he did not have to wait on the forecast to be delivered by hand to his store. the devastating flooding that accrued. One of the stories, which had a widespread impact, was the "The Great Blue Norther of November 11, 1911." high of 80°F (27°C) before the cold front, 40°F (4°C) by nightfall, and a record low of 13°F (-11°C) by midnight. In doing the math, this was a temperature difference of 67 degrees. The main cause for the dramatic cold snap was an extremely strong storm system that separated the warm, humid air from the frigid, arctic air. "Increasing S to SW winds shifting to the NW at 3:45 pm and attaining an ex. (extreme) velocity of 74 miles for one minute. Considerable damage done to buildings, wires, and trees. Many windows blown in and several people injured. Record high temp. occurred about 2 pm and low temp. for this early in the month. Temp. fell from 80 to 21 at 7 pm. Cold wave order received and given usual distribution. Hail, sleet, rain, and snow fell. First thunder 4:52 pm. Last 6:10 pm. Storms came from north." Our local paper reported that we experienced a large wind that blew down corn, haystacks, fences and a few trees. They said after the cold wind hit it started to snow and sleet and that the temp. dropped dramatically behind the front. last Saturday afternoon. The temperature fell 72 degrees in 12 hours and 50 in two hours and thirty minutes, registering 8 above by Sunday morning.” The cold front froze chickens on their roosts and generally made everyone uncomfortable. reaching the safety of their farm and woodstove. This storm caught many people in warm summer clothing and for years afterwards families would be sure to have a coat or blanket with them on a trip to town no matter how warm the day started. and Wisconsin. An F4 tornado occurred in Janesville, Wisconsin where 9 people were killed and 50 were injured. the 100-year anniversary of the Blue Norther. aircrafts with such stunts as precision flying and ribbon cutting. The pilots also offered passenger flights. In August of 1944 a private business venture called the Bolivar Airport opened up on 40 acres just west of Bolivar. (Located at the current site of the State Highway Barn, on Hwy 32 east of Hwy 13.) Francis L. Rogers owned and operated it. He offered instruction, charter flights, airplane sales and service. He leased the privately held airport to A. W. Spiva in October of that year. Spiva built a hanger on the land and offered refueling of planes. Spiva was a veteran of World War II and spent four years in the Army Air Corps as a test pilot. He learned to fly by joining the flying circus at Oklahoma City when he was 19. He had made over 250 parachute drops by the time he leased the Bolivar Airport. sightseeing rides and plane demonstrations, doing such dangerous stunts as landing his plane on a "dead stick" (a term used when a plane motor has died). Some of his fees in 1945 were charter trips at 15 cents per mile, sightseeing trips – in a Cub plane for $2, and in a PT-17 for $2.50, and student instruction – duo for $10 per hour, and solo for $7 per hour. He also featured "Special Fishing Trips" to the Lake of the Ozarks and Ship-by-Air service. $25,000 bond issue to build a city airport. It passed on October 30 with a vote of 343 for and 79 against. a Bolivar Airport Commission to oversee the project. a federal grant before breaking ground. tight a bank, or hit an air pocket, or his engine began to miss. Whatever the cause, his plane dipped suddenly and crashed into the field in back of the A. L. Wickard house, bouncing some distance.” Dr Zumbrun survived the crash but was hospitalized for sometime. He died in 1979 and is buried in Greenwood Cemetery. Bolivar coffers. This was added to the $20,000 they had from a bond issue and the future airfield seemed on the horizon. a cafe called the Airport Diner run by Vernon Ables. and commenced construction of an airport, which was completed in time for the unveiling of the Simon Bolivar statue. This also included a visit from President Truman. It is interesting to note that this airport was constructed within one-half mile of the successful, existing private commercial airport. celebrated with church services and basket dinners anvil shooting. In 1876 at our 100 year Celebration of Independence - Mr. A. C. Lemmon wrote and then read, at the 4th of July picnic, a discourse on the history of Polk County 1835-1876. The paper reported that most of the town had driven to these celebrations. Interestingly though some of the boys of Bolivar had no problem churning up some excitement. Nothing happened in 1880 – 1882 except quiet, sedate, box suppers, cotillions in the courthouse and ice cream socials. with floats wagons decorated with flowers, speeches and a dinner in a grove - near the park north of town. pleasant and the program was carried out successfully. in their handsome uniforms, the goddess of Liberty with her attendant thirteen states, music and song, eloquent addresses, an exciting speed contest on the race track (this would be horse racing) a ball game and other amusements with a brilliant display of fireworks that night. declined to allow the use of the water-works. struck by a rocket, which broke both bones of her leg. It is a painful wound and serious on account of her age. until this morning when she was moved to her home a mile south of town. knocking him down. He fell upon some rocks and bruised his shoulder but is not seriously hurt. (now CMH administration building on the east side) breaking the glass and igniting the curtain. (I bet the city council wished that they weren't fighting with the contractor at this point. hold unless it rained. It did not rain. Jumping back to 1910, (the first year of the drought) they had a large celebration on the square. located in northeast Bolivar. West and south of the current High school campus. President Harry S. Truman and Mayor Doyle C. McCraw were the dignitaries in attendance. Here is a YouTube Video taken the day of the dedication. Free Press) and the Fireworks show at the Lucky 13 drive-in theater, paid for by owners of the theater. (Located on the southeast corner of the interchange of Hwy 13 and 32. The city planned a parade for Saturday the 3rd. It was almost called off because of a lack of interest but the town came through in the end and eventually had 32 parade units registered. Then mother nature messed up the plans with “The great flood of 1976” Bolivar received 3 to 6 inches of rain, in 1 hour on that morning. The parade and festivities were rescheduled for Monday the 5th. The 5th dawned warm and clear so the parade, steam engine show (on the square) and the Independence Day Horse Show went on as planned. Sunday night was devoted to the Bolivar Ministerial Alliance program at the high school grounds (middle school now) Praying, singing and speeches were the order of the night culminating in a fireworks show. wrong punctuation and spelling ) for a customer query and I thought it was worth sharing. Be safe and have a celebratory 4th! other services. One of the biggest employers a town can benefit from is a factory. in 1901 and opened a factory in St. Louis. He felt that a larger city would give him an opportunity to expand his business venture. In St. Louis he found a larger building and an unlimited work force and the company known as Tums was born. In 1919 the Bolivar Commercial Club, which in 1927 became the Bolivar Chamber of Commerce, was approached by the D. M. Oberman Manufacturing Company about installing a factory in Bolivar. The Oberman Company made ready-to-wear garments like overalls and pants. They had secured a government contract to supply the military with wool uniforms during WWI and WWII. The Oberman Company started out using female convicts from the Missouri State Penitentiary but, by the end of WWI, they had out paced the amount of labor the prison could supply. They then opened a large factory in Springfield and about 15 satellite factories in other towns. Bolivar was chosen as one of those towns. The Oberman Company and the Commercial Club agreed on a plan where the Commercial Club would supply Oberman with a rent-free space for three months and, at the end of three months, they would supply a facility, once again rent-free, that would be capable of holding 125 sewing stations. In return, Oberman agreed to maintain an overall factory in Bolivar for five years and pay out in wages - $75,000. If they met these conditions the building would become theirs, but if they failed in either respect, the building remained the property of the Bolivar subscribers. quarters. The Oberman Company installed 50 sewing machines and started advertising for young ladies. The company offered to pay $1 a day (translated to $12.30 a day for 2011) during the ladies’ training period with increases according to piecework. It was reported that some of the women in the Springfield plant were earning as much as $4.50 a day. The Commercial Club met to raise money for a permanent location for the factory. They raised $6,500 from the local businessmen in less than 24 hours. They then purchased a building on north Springfield from A. C. Reed, which at the time was the home of Payne’s garage. In later years it housed the Ritz Theater and then the bowling alley. This is currently part of Roweton’s Home Center. It is the showroom on the north side of the alley. except for Lota Fink, 22 years old. Commercial Club and was sold in July of 1927. My thoughts on the demise of the Bolivar plant have to do with the hiring of rural, small town young ladies. Bolivar was sorely behind the times. We still believed that a women’s place was in the home and that it was okay to work for a while if you needed to, but as soon as you married, your life became one of taking care of the home. I think our lack of a single female workforce kept the plant from being profitable and caused it to close. and gone across the Bolivar landscape. it is a time to reflect on living in a small town and its traditions. The following is a brief history of how Bolivar got its siren. The first official involvement by the city towards fire protection was in 1885, when the city purchased a large bell. bucket brigades from the nearest water supply. four blocks of the square so as to be able to hear the bell when it was rung. four times a day to prevent the reed (inside of it) from drying out and thereby not working when there was a fire. This was one long blow of the siren instead of the coded siren blows to tell the fire department which city ward the fire was in. The times were set at 7 am, noon, 1 pm and 6 pm. I am sure that the times chosen had to do with peoples’ work schedules. So, remember when you hear the siren blow, it has been a Bolivar tradition for 84 years. reunion grounds for the old settlers’ picnics, Grand Army of the Republic, and various other groups. tourists were allowed to set up and camp for free. This was later disallowed. dam could be widened to a two-track width and concreted. A gravel swimming bar was added to the lake for the children. The octagon shelter house and bandstand (now known as Pavilion 1) was added to the park in 1933. It measured 30 feet in diameter and was built by John Woskoski. In the 1940s, improvements such as cooking fireplaces, native stone tables and benches, a shuffleboard and oversized checkerboard were added. In 1949, the park board improved and blacktopped the drive and added more children’s playground equipment near the shelter house. out. Owing to depredations committed at night, the Park Board has ordered the gates shut and locked at 9 o’clock at night. The trees, shrubs and flowers are for all visitors to see and enjoy, so please do not break or pull them. For if you do there soon will not be any left for anyone to see. No hunting with dogs or guns allowed. Leave your dogs and guns at home. hollows of the Ozarks. Most had never seen such wide-open spaces, cows, deep woods, orchards and ticks. Polk County committee consisted of D. W. Faulkner, T. H. B. Dunnegan, J. J. Akard, J. W. Ross and F. A.
they are seventeen years old for their board and clothes; then they are at liberty to make their own arrangements. Mr. E. Trott. The citizens of Bolivar, who met the train, were pleasantly surprise by the appearance of the children. The children were transported to the courthouse and seated in a row of chairs within the railing of the courtroom. out a "bright thirteen year old boy" named Henry J. Smith. Mary Hicks, eight years and six months, taken by F. W. Adams, of Bolivar. and Jacob Good, aged six, taken by Rev. J. F. Martin of Bolivar. care and could be removed if it was not adequate. The Society also planned yearly trips to check on the children. them still living in the county in 1900. One of them was embraced by the family and even took their surname. cast-off children. I can only hope they found peace and happiness in our Ozark Hills. with the county paying $5,300 and the business owners on the square picking up the remaining amount. D.C. or used as a doorstop until lost to time. would look like if the child stepped in the mud. I always thought the rock was a wonderful thing. no moccasin rock. We were all afraid it was gone forever. Nifty had sold 14,400 bottles of their product in 1932, more than any other business in the area. of cold Budweiser beer with a meal. at 25 cents per person. No beer was served in this new area. Cunningham’s brother Elmer “Sparky” Cunningham became a partner in the Nifty. A month later it was announced that Mr. and Mrs. Robert Hendrickson had bought the Nifty. Interestingly, the dinner prices in their advertisements took a jump and they discontinued beer sales. makes it over 78 years old and probably the oldest continuously operating restaurant in Polk County. One day Jack Glendenning mentioned "Cheese Hollow" to me [Susan Sparks] in a conversation about local history. with the thought of locally made cheese. And so began my journey to learn the history behind "Cheese Hollow." Cheese Hollow). They made butter and cheese for the Springfield and Bolivar markets. The daily supply of milk in 1889 approached 1,200 pounds with the Lindsey family supplying about one-third of that amount. in Buffalo, Morrisville and Stockton. The company was called the United Cheese and Butter Company. The company quickly expanded with additions to the original building by the end of 1928. The factory building was built by local builder Perry Ryan and leased to the United Cheese and Butter Company. The factory building still stands at the corner of Jefferson Street and South Benton Ave. and currently houses the Huckleberry Layne Candle Company. The Bolivar Chamber of Commerce agricultural committee decided, with the opening of the cheese factory, to make the dairy industry their main objective for the year 1928 and started a promotion called Dairy Day. The chamber would purchase a cow from the Wisconsin investors and give it away on the last day of each month. The first Dairy Day was on March 31, 1928. A ticket was given to shoppers for each dollar they spent with certain merchants for the month of March. One of the first rules was that "the event was for out-of-town shoppers only." I assume the reason for this was that a town dweller would have no means of taking a cow and building up a herd in the city. high production record" and was won by Frank Standley of Violet, MO who held the winning ticket numbered 033630. The thirty merchants that gave out tickets for dollar sales estimated they had given out over 30,000 tickets. The second Dairy Day was held on Monday, April 30, 1928 with the winning ticket being held by Lloyd Dixon of Morrisville. He took home a fine Guernsey cow. A special feature of the second Dairy Day was the free lunch of cheese, crackers and coffee served in the courthouse basement. It was reported that 1000 lbs of cheese from the Bolivar cheese plant was consumed. traveled to Osceola to help them start their own Dairy Day. After the May drawing the committee in charge of purchasing the cows decided to add a few bred heifers to the mix and also added a drawing for a dairy bull. Ruth Grinstead won the heifer. Ruth took the option of auctioning off the heifer and went home $105 richer. The bull was to be awarded to a school district and was to be used in that district for three years to improve the herds in the neighborhood. The first bull was won by the Forest Grove school district. In October of 1928 the chamber arranged for special premiums to be given away, the first being 10 ducks. Others included through the years were sheep, geese and turkeys. In November 1928 they drew tickets for two of the geese and then threw the other four into the audience, which started quite a scramble. The Depression hurt the cheese factory just as it did other businesses and they could not pay their creditors, so in May 1932 the plant became a locally owned property. In July 1932 the plant was sold to J. E. Mayfield of Cassville, MO and reopened. The Dairy Day committee started giving out trade tickets as prizes, worth $10, to be redeemed at local merchants. By 1933 it was reported that 93% of the farms in Polk County had dairy cows thanks to the Dairy Day promotion. The plant was sold once again in October of 1933 to Ernest Porter of Mountain Grove, MO. In March of 1935 the N. W. Maas & Sons Company purchased the Bolivar Cheese Company plant. They soon after sold it to O. E. Moore & Sons of Aurora, MO who renamed it the Bolivar Milk Products Company. under 80 that would get married that day, February 29. The wedding was to take place on the steps of the public library. Unfortunately, there were no takers. (At one point, in Dairy Day history, the tickets were also drawn on the front steps of the library.) By 1937 the Dairy Day was to be held on the last Saturday of every month instead of the last day of the month. until the last Wednesday of the month. The tickets were then gathered from the merchants and numbers drawn. The winner walked away with trade cards to be used at local stores. During WWII war bonds were given as prizes. a by-product of the cheese making process, was given back to the farmers to feed to their hogs and chickens. If the whey was not wanted it was pumped into the Town Branch to be carried downstream. I believe this is what gave rise to the moniker "Cheese Hollow" for that area of town. In 1944 the cheese plant invested in whey-drying machinery so the whey could be sold. The city had also installed a sewer system in 1935; both of these improvements did wonders for the Town Branch and for the quality of life in the neighborhood. In January of 1946 the committee changed the name back once again to Dairy Day with the prize of a heifer being awarded. The Bolivar Milk Products Company was sold to Standard Brands, Shefford Division, New York. In October of 1950 they gave away four registered ewes. Dairy Day seemed to just fade from view sometime in the late 1950s. here to an Aurora plant for processing. It briefly reopened cheese production in May 1959. March of 1966 signaled the end of the Bolivar plant when Standard gave the Pet Milk Company a lease-option arrangement and Pet Milk had the milk sent to their Humansville plant. Knox Addition. In addition, he planned to cut and store ice from the pond to be sold for summer use. The construction of the pond and park took two years. When finished in 1887 it was about an acre and a quarter in size with banks six feet in height. In the center of the lake they constructed a circular island. The land was landscaped with willow trees and a picket fence. The Hatler-Keys Lake was a popular spot in the winter for ice-skating and in the summer for swimming and boating. empty in 1933 when the city purchased it from K. D. Roweton for $400. In 1933, while Bolivar was still suffering from the depression, there was money for special projects available from the national Civil Works Administration, C. W. A . So using government money and labor from the unemployment relief works, Bolivar decided to build a public swimming pool. The swimming pool was constructed as “a sand bottomed pond” having a shallow wading pool at the beach end, with the other end reaching a depth of 8 feet. The improvements included a “modern” bathhouse with lunch counter, ping-pong tables, beach umbrellas and a six- foot life saving wooden tower. Season tickets were $1 for adult and 50 cents for children. One of the highlights of the season was the swimming and diving competitions. In the summer of 1939 the American Legion sponsored the Mid-West Livestock Fair and hired as a manager Mr. L. J.
Lunceford. The event was held at the old fairgrounds northeast of Bolivar. Mr. and Mrs. Lunceford owned and operated two of the largest fairs at that time. One was the State Line Fair at Eupaula, Alabama where Mr. Lunceford was born and raised and the other was the Huston County Fair at Dothan, Alabama where Mrs. Lunceford was born and raised. The fair started on Monday, July 3 and ran through the weekend with Gene Autry scheduled to appear twice on both Friday and Saturday. Some of the other entertainment scheduled was The Golden West Cowboys and Frankie Moore and his Log Cabin Girls. until 7:30. Strange as it may seem, the paper reported that there was no large crowd present at the pool and no one asked for an autograph. several pairs of trunks to rent but on this evening there was only one pair left. The trunks that were available were an old faded pair with several holes and no belt. Gene took these trunks into the bathhouse, changed into them and stored his clothes in basket number eleven. he was, he just smiled and continued to enjoy our pool. allowed to take their stock home as soon as it was judged. The cost of all the entertainment came to about $4,500. his pay from the fair. Maybe because he had such a good time in our pool. learned a lot about the hidden history of Polk County and Missouri since this project started. I recently ran across a file created in 1866 with Civil War ties. The file was State v Isaac M.
the soldier’s being deposed. Depositions recorded from fellow Confederate soldiers in Capt. 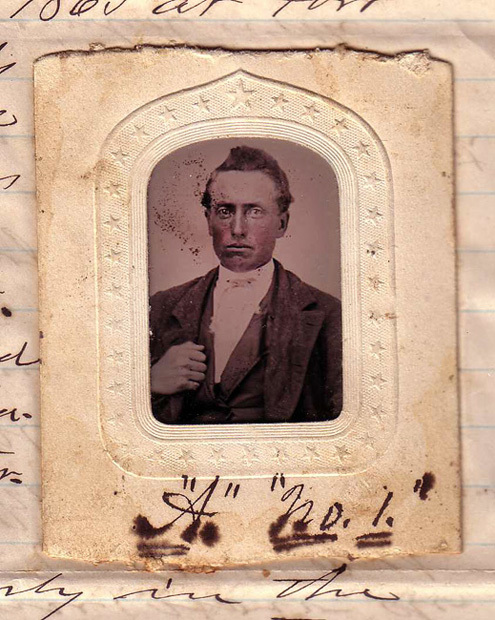 John F.
died at Little Rock in March 1863.
photo that has been found. born 10 Feb 1837, died 9 Aug 1912, West End Cemetery, Stephenville, Erath County, Texas. Shop now to get them sent to your door! *"First Families of Polk County, Missouri" Click here to find out more information on the First Families program.This is an ongoing project, so you are not too late! Shop now to get them sent to your door! Click here to see a list of First Family names already certified as part of the program.